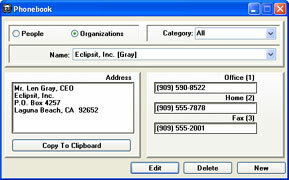 Any program that tracks time and events as closely as Einstime would not be complete without tracking people or organizations and their contact information. 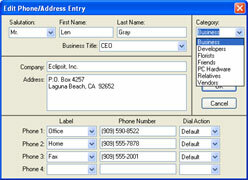 Einstime's Phonebook window collects and organizes this information for you. Einstime let's YOU decide what categories, titles, locations, and salutations your phonebook needs. Just enter your text and Einstime adds it to its memory for you to use again.